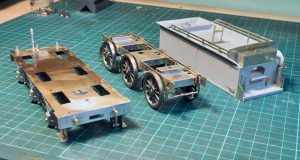 With the rolling chassis complete attention was turned to making up the tender body. 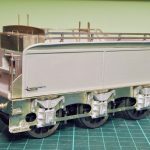 The main tender body is a resin casting, the original casting supplied in the kit was the wrong one, a small 2500 gallon tender. 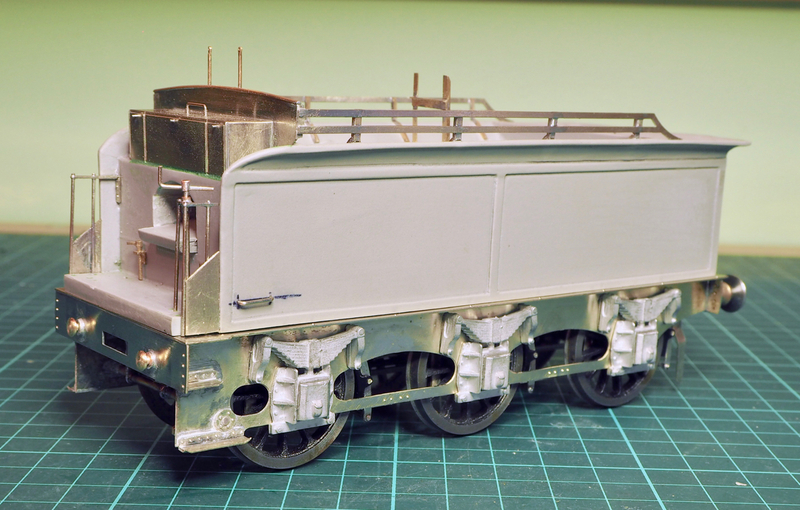 This was despite the markings on the box stating it to be a 3250 gallon tender, presumably this one was from the 2F kit. Although fair play to JLTRT when contacted about the mistake they put the correct 3250 body in the post straight away without any quibble. 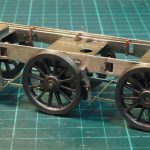 So a start was made on making up the footplate and side frames. As detailed in the previous post the side frames supplied are the wrong shape, rather than try and correct the errors a set of etched replacement frames were drawn out and etched by PPD. 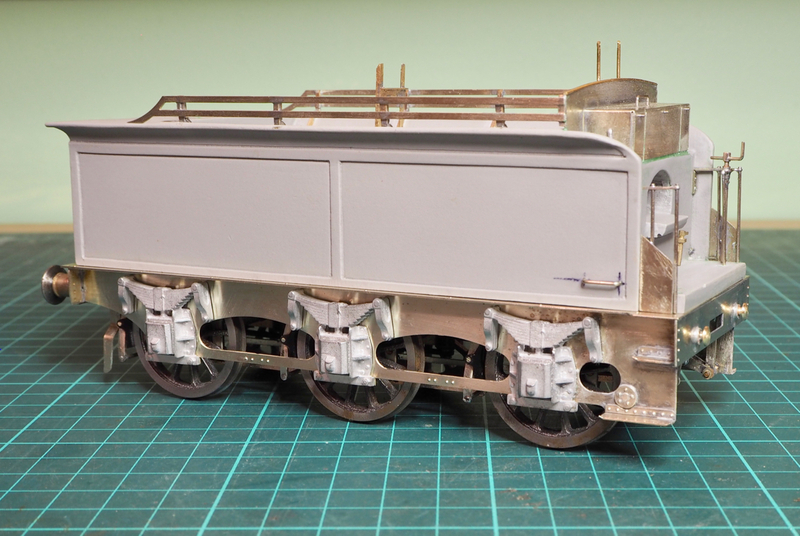 The supplied buffer beam was also the wrong width for the footplate so a new one was made. This was soldered up to provide a square base for the resin body. Further study of the photographs and drawings showed that the axlebox castings supplied were completely the wrong style. They may well be representative for a few tenders but for the prototype I had selected they were wrong. The bolts for the keeper plates were aligned vertically whereas they on my selected loco they were shown to be flat against the side of the tender frame. Whilst at the York Model Railway Exhibition I found a set of Alan Gibson castings which match much better. The kit instructions also show the front steps on a separate hanger plate, which is how I started to build the kit as shown above. However when I looked at the photos I realised that whilst there were a couple of tenders with this arrangement I don’t think it was that common. Most front steps on these tenders seemed to be mounted on the frames directly so the instructions got binned and I just worked out things my own way. The plastic tender body has been a real pain I really didn’t like it, the curved tops are too fragile, at the rear you can just see I’ve had problems with it breaking, it’s been glued and filled with Squadron Green putty so I just hope it gets hidden under a coat of paint. On the inside along the length of the tender I glued some brass angle and drilled half a dozen holes for tapping 8BA. 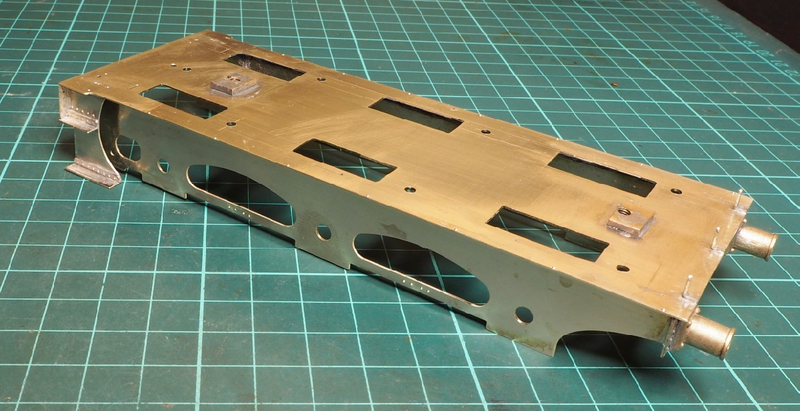 So the resin body is bolted to the external frame – these are the main components. 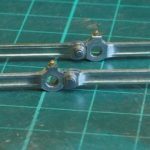 Other changes from the kit – the lamp irons are castings but are far too thick and bulky so the rear brackets were made from scrap etch. 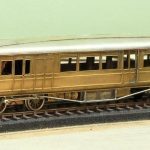 Some tenders had a small extension plate covering the front vertical handrails – a little bit of 15thou nickel was cut out and soldered in. The etchings for the coal rails were ok for the rails but the vertical tabs weren’t connected in places, they should have been half etched but were actually etched all the way through! So I bent up some brass angle mounting brackets and soldered it all up as a unit with the front coal plate and toolbox. 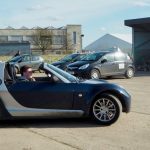 This could then be glued in as a single unit – this is one item that is usually prone to handling problems but this has made the made them surprisingly resilient. That’s nearly it for modifications – the draw plate buffers to the loco were not supplied so they were turned from a bit of brass bar. Final clean up is required and then it will be ready for the paint shop.